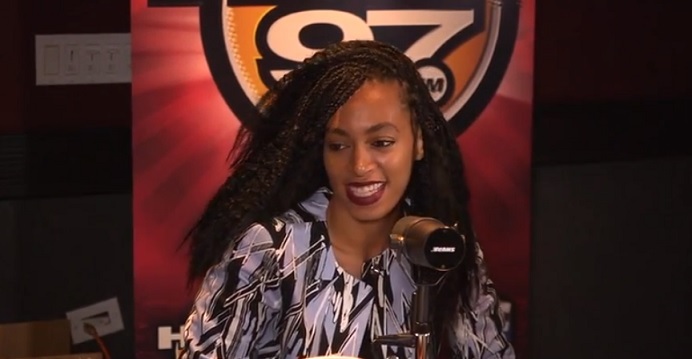 Angie Martinez brings in Solange Knowles for an exclusive interview on her HOT 97 radio show. The conversation kicks off with the two discussing Solange’s album artwork which was inspired by an artist she says she discovered in New Orleans. Knowles continued by explaining she temporarily lived in the city and spoke highly of the culture. The sultry songstress also shared a funny story of recruiting Beyonce and Kelly to handle a bully that had been giving her a hard time at school. Before heading out, Knowles touched on her pro-spanking attitude and admitted she doesn’t eat meat. This entry was posted in In The Studio, Interview, Video and tagged hip hop, hot 97, Interview, new york, r&b, radio, rap, solange. Bookmark the permalink.